Pied-butcherbirds chicks are usually born in early December. Peter Gregory rescued a pair of chicks and had to work hard to rescue them, but found it was well worth the rewards of his Christmas gift. Here's his story. 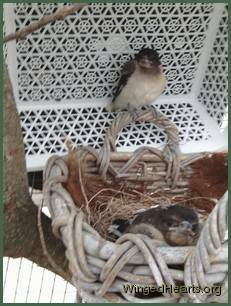 Last week we lost two of our pied butcherbird friends. Gerry started getting sick first, with what looked like the same problem we successfully cures his relative Butch from last year. His eyes crusted up and it became hard for him to see. Unlike Butch though, Gerry wasn't at all interested in getting caught and taken to the vet etc. So we had to feed him antibiotic-soaked bread as the only way to get some medicine in him. I told you about the conference the pied butcherbirds held on our mulberry tree. Since then, we have not seen Gerry's parents Freddy and Terry. Remember, Gerry is their nine months old bub. Gerry has been holding the main butcherbird territory all by himself every since. Two of the five of the newcomer birds think they have the right to live there with Gerry, and they have had a few arguments about who is allowed to take food where.